If it's fried dough ye crave on Talk Like a Pirate Day, then straighten yer eyepatch and pull on yer boots and head to Krispy Kreme doughnuts. Free doughnuts will be the result. Krispy Kreme is getting in on Talk Like a Pirate Day with a tasty grub giveaway. On Wednesday, September 19, any buccaneer who dares to enter a participating Krispy Kreme location talking like a pirate gets one free Original Glazed doughnut. · Come to a participating Krispy Kreme location in full pirate costume for one free dozen Original Glazed doughnuts. No weapons allowed. Krispy Kreme. Fattening up pirates since 1937. P.S. 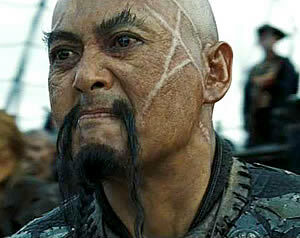 I was going to insert a picture of a really fat pirate for today, but it turns out that if you search for "fat pirate" you mostly get pictures of Chow Yun Fat as a pirate. P.P.S. Since it's Tolkien Week, you could try to dress like a hobbit or a balrog and see if you can convince them to give you something. But you better take an eyepatch just in case.